JAN-PRO has been providing janitorial services in Kitchener-Waterloo to all sorts of businesses and industries in need of dependable, high quality cleaning. The “Tri-Cities” region of Kitchener, Waterloo and Cambridge has been referred to as “the Silicon Valley of Canada” thanks to several large technology companies locating their offices in this area. The area is also home to a number of large manufacturing facilities, insurance firms and post-secondary education institutions such as Wilfrid Laurier University & the University of Waterloo. At JAN-PRO, we want you to be 100% comfortable with the office cleaning team you have cleaning your facility. This is why we take multiple measures to ensure we not only offer you a great clean, but one that is secure and healthy. First, all of our cleaning teams in the Kitchener, Waterloo and surrounding area, are owner-operators. They are not employees. We’re a franchise based system, meaning that the individuals coming into your facility to provide the cleaning services, have invested in your property to build their business. They want to ensure that you are a happy customer! These owner-operators are also certified. At JAN-PRO, all franchise owners must complete a 5-week training program before starting to work in any commercial facility. This means that they have been trained on the JAN-PRO clean. We have very high standards for what we say is clean! You can be assured that your team has been fully trained to provide the best janitorial services. Not only that, but all members entering your facility are bonded and insured. That way you can feel confident in the people coming in to your facility. At JAN-PRO we want to provide the best office cleaning services to ensure you have an efficient and healthy workplace! If you’re ready to take the worry out of your office cleaning services, contact us now to receive your free quote. Whether its small office cleaning requiring service once per week to a large corporation with service taking place seven days per week, JAN-PRO is well equipped to ensure trustworthy and consistent cleaning. Our sales staff will work with you to ensure you get the best commercial cleaning quote, not only for your budget, but customized to meet your specific needs. Our operations stall will ensure the high-quality service does not deteriorate by way of routine inspections and courtesy calls. Lastly, you can rest assured knowing your facility is in safe hands as all our owner operator cleaning teams are bonded, insured, have taken extensive training and a certified in the JAN-PRO clean. Prior to joining JAN-PRO Cleaning Systems of Southwestern Ontario as owner operator, Al spent more than 25 years in the FMCG/Agri-business industry. During this time, his roles ranged from research and procurement to senior roles in operations management and business development in Canada and internationally. 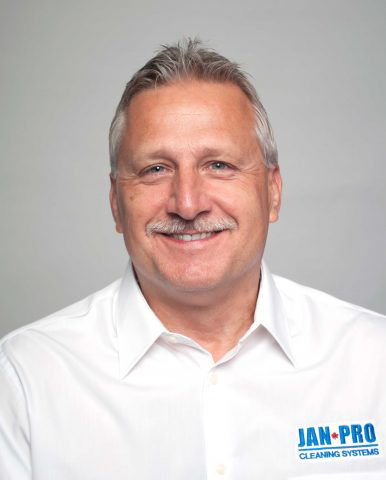 Al’s years of experience managing customer needs are a valuable asset to JAN-PRO as the business expands into the Southwestern Ontario area. JAN-PRO Cleaning Systems of Southwestern Ontario is a regional office that opened in March of 2014. Located in London Ontario, the office has now grown to include two additional branches located in Cambridge and Windsor, serving the areas of Windsor, Kitchener, Waterloo, Guelph, Cambridge and those surrounding areas. Our office has attracted many motivated business owners to start their own franchises. The initial interest and growth of our selected franchisee base has exceeded our regional expectations.